I think we've established at this stage that I'm a huge fan of Charlotte Tilbury makeup (posts here, here and here for example) but I rarely talk about her skincare products. 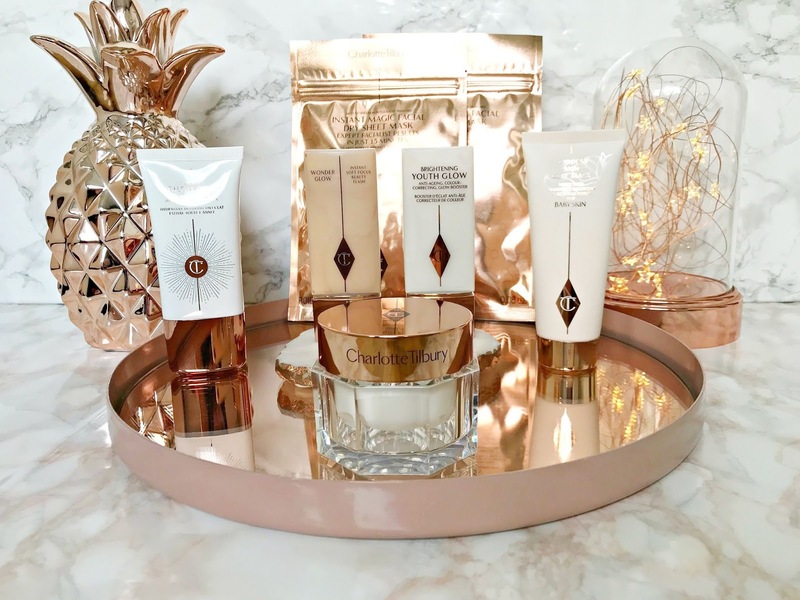 Because Charlotte Tilbury is Cult Beauty's Brand Of The Month for September, which means there is free international shipping on all orders, I thought it was the perfect time to discuss her skincare range. Because Charlotte's focus is mainly on makeup, her skincare line isn't huge (yet) but based on her years of experience as a makeup artist, she knows what products to use to prep the skin for an even and long-lasting makeup application. As with her makeup, the packaging of her skincare is very aesthetically pleasing - rose gold and white, but it's what inside that counts so let's get on to the products themselves. Goddess Skin Clay Mask: I read that this mask was used on Amal Clooney to prep her skin on her wedding day and I knew I needed it in my life. Unlike most clay masks, this doesn't dry out completely, which means that it doesn't feel tight and uncomfortable on the skin and doesn't leave it looking red. It contains Spanish clay, which deeply cleanses the skin to draw out toxins and rosehip and sweet almond oils, both of which hydrate and nourish the skin. Every time I use this, my skin is left feeling baby soft and looking clear with refined pores. I always bring sachets of this mask on holiday as it perks up my skin instantly and glows. I love this product. Instant Magic Facial Dry Sheet Mask: I've tried numerous sheet masks but never a dry one before these. The benefit of dry masks is that they don't harbour bacteria and therefore can be re-used - 3 times is the recommended number of uses for these particular ones. This mask has two parts and ear loops, therefore you don't need to lie down with this mask on and can carry on with anything you need to do. Once you apply it, you massage the top to activate the ingredients. Once removed after 15 minutes, there is no doubt that my skin is soft and plump but the problem for me is that it contains shea butter, which my skin hates! Shea butter is a very nourishing ingredient so unless you have issues with it, you will enjoy these masks but it breaks me out so I can't continue using these but my mother is loving them! At £18, they aren't cheap but it works out at £6 per use so that makes it a little more justifiable. I think (unless you can't use shea butter) that these masks would be ideal for people who travel a lot as they really do hydrate the skin and the fact that they are reusable and don't take up much space, means that they are perfect even for hand luggage only. Magic Cream: This moisturiser also contains shea butter but it isn't as high on the ingredients list as on the masks. Because I have Sahara levels of dryness, this moisturiser isn't rich enough for me but if you have normal or combination skin, this will work for you. It contains hyaluronic acid, which all skin types will benefit from, aloe vera and damask rose to soothe inflammation. For me, it works well as a primer as my skincare products create a barrier between the shea butter and my skin and it preps my skin for foundation. Curiously, my body doesn't react badly with shea butter so I like to also use this on my neck and décolletage to plump and hydrate my skin. Unisex Healthy Glow: Now this is a product that I LOVE! I have never been able to find a fake tan for my face that doesn't break me out or dry my skin even further and even when I get a natural tan on my body, my face is always lighter so this is the perfect product for anyone with those issues. It's a light lotion in texture and looks almost grey-tinted in colour but when blended into the skin, it changes colour and adds some warmth to the skin. It doesn't make me look like an oompa loompa - it just blends into the skin to create a natural glow whilst blurring pores. I love it on no makeup days but it also works well as a primer. Brightening Youth Glow: Crossing the lines between a primer and skincare, this product does a number of things. It blurs the visibility of pores, plumps the skin, blurring the look of fine lines, hydrates and adds a glow. Again, this is ideal for no makeup days to give the skin a lift and it also works well as a primer. Wonderglow: This is technically a primer but it's the perfect antidote to dull, fatigued skin so could be used after moisturiser to brighten the skin on no makeup days. The glow doesn't look fake - just very 'lit from within' and dewy. It is ideal for dry skin but I don't think that anyone with oily skin would like it as it's high in the glowy stakes. Are you a fan of Charlotte Tilbury skincare? I'd love to hear your thoughts. Don't forget that there is free international shipping on all Charlotte Tilbury products for the month of September on Cult Beauty! All products are bought by me, unless otherwise stated. Most of these products were kindly sent to me but some I had previously purchased myself. Opinion is always my own.